Grab a large bowl and add in the cookie flour, cacao powder, baking powder, and salt. Whisk to combine and set aside. Add the oil and sugar to the bowl of a stand mixer (a hand mixer can work too! ), and beat until the mixture is well combined and begins to get fluffy, about 2 minutes. Add in the applesauce, melted chocolate, espresso powder, and mint extract. Mix until well combined, scraping down the sides as needed. Once the wet mixture is thoroughly mixed, add in half of the dry ingredients and mix on medium-low until there are no streaks of flour present. Scrape down the sides and repeat with the remaining flour. Place the dough in the fridge for 1-2 hours to firm up. 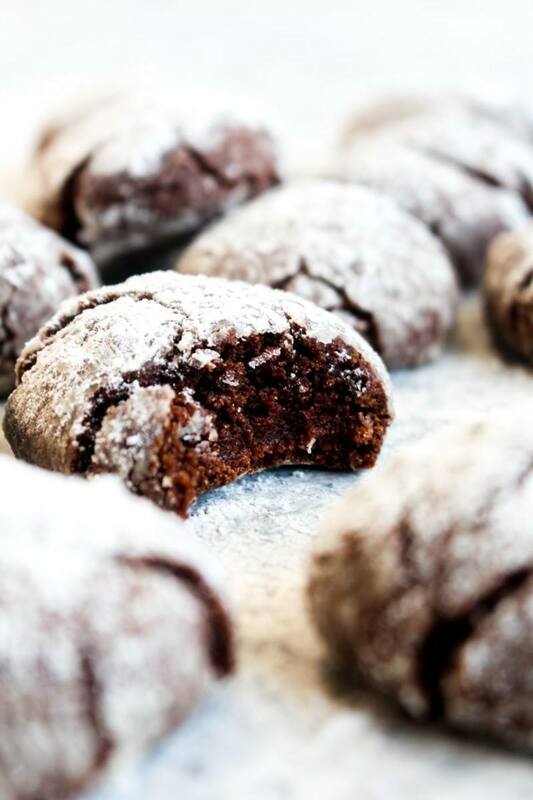 Once you are ready to bake the cookies, preheat the oven to 350 degrees and place the powdered sugar in a small bowl. Roll the dough into 1 inch balls and place them in the powdered sugar. Shake the bowl gently from side to side until the entire cookie is covered in powdered sugar. Place the cookie onto a baking sheet coated with nonstick spray and repeat until all the dough is rolled. Bake for 12-15 minutes and remove from the oven. Let the cookies cool on the baking sheet for 2 minutes and then transfer to a wire rack to cool completely. Serve and store any leftover cookies in a lidded container at room temperature.